One of the coolest things you can collect are the teeth from the extinct prehistoric sea beast Megalodon. 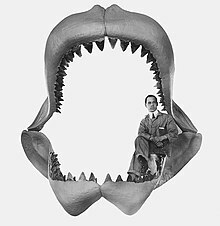 The Megalodon is an extinct ancestor of the Great White Shark and its teeth are collected by fossil hunters everywhere. They come in various colors depending on where they were fossilized, and which minerals replaced the biological material of the teeth during the fossilization process. thousands of dollars, if you can actually find one. There are a few teeth longer than this, but due to restoration processes their natural length cannot be ascertained. The largest tooth not restored is thought to be around 7 1/8 inches (18cm) long. Six plus inch teeth are far more common and in the right condition, color, and girth, a 6 incher could be the crown jewel of a collection. If a Megalodon had 6 inch teeth or 7 inchers in its mouth, it's body would have been about 50- 60ft, or 15-18m long. This is a beast that could never be beaten off by a swimmer or surfer like modern sharks sometimes can be. The Megalodon could most likely swallow you whole.